HSBC: "Hedge Brexit with the Swiss franc"
According to HSBC’s currency strategists, lead by David Bloom, “Brexit would be a colossal event for Europe. We believe it would drive the pound weaker by 15%-20%, and would likely drag the euro lower with it” as reported in a weekly strategy note published on Monday. That said, selling the national currency, the pound sterling, in anticipation of a possible “out of EU” outcome is not such a good idea, because sterling would likely rally on a vote to remain. Since the result of the referendum is still far from being predictable, “We believe the CHF is the best hedge against Brexit risk,” the strategists said. So if the proposal to exit the European Union is rejected, then the Swiss franc is unlikely to weaken much as little political risk seems to be priced into the currency. If, by contrast, the U.K. votes to leave the EU, then the franc would enjoy a sizable safe-haven bid amid the scramble out of the pound and euro. Overall, the franc “will capitalize on Brexit but not suffer should Britain choose to remain in the EU” HSBC concluded. 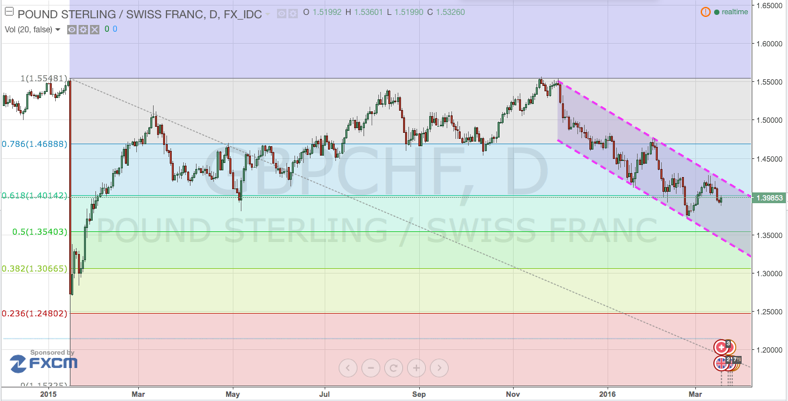 As we can see from the graph above, from the last months of 2015 the GBP/CHF pair is clearly in a downtrend, due to both the appreciation of the Swiss franc because of its safe-haven appeal in this harsh beginning of the year, and to the depreciation of the pound, caused by the fear of an exit from the EU.